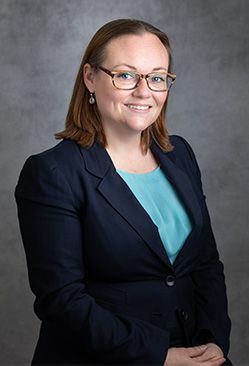 Attorney Kristen R. Jones joined Gudorf Law Group in 2019 in the Estate Planning department and also serves as the firm’s Funding Coordinator. In that capacity, she assists clients with the transfer of assets into their trusts. She also prepares estate planning documents and reviews finalized documents to clients to ensure that they understand and are comfortable with what has been prepared for them. Kristen brings with her to Gudorf Law a wealth of experience in finance and estate planning, including legal work in multiple states. In addition to her previous work as an estate planning attorney, Kristen has served as an assistant state Attorney General in Wyoming and as a Judicial Law Clerk in Virginia. Kristen is an asset to the firm not only for her depth of legal knowledge in the subject matter that is important to our clients, but for the diligence and attention to detail cultivated in her prior work. She derives great satisfaction from the opportunity to assist the firm’s clients in their estate planning needs. When not in the office, Kristen is involved in the community as Treasurer of the Military Spouse J.D. Network and the Military Spouse J.D. Network Foundation, in which she works closely with the Board of Directors to plan, schedule and strategize to fulfill the mission of the organization, which represents the interests of over 700 military spouse attorneys. In addition to her legal work and volunteer activities, Kristen enjoys exploring the Dayton area with her husband, two young sons, and dog.